Outdoor preparations should begin with the front yard, especially if you’re considering selling your home. First impressions will make a big difference in prospective buyers’ perception of the property as a whole. But it’s not as simple as you might think. A poor landscaping job can actually make your home less likely to sell. Here are our top tips for whipping your front yard into shape to get it ready for the selling season. If this is your first experience tackling a landscaping project, don’t plan an elaborate garden oasis. A three-year landscaping plan works best for starting from scratch, but a yard update should take a fraction of the time. Start with the simplest changes that look great on their own. Sketch a plan and divide it into phases. Start with walkways and foundation plantings. Then, tackle the borders. Calling attention to the entrance focal point pulls the buyer’s eyes to your home. Pro tip: When you’re drawing up your plans, consider both how the garden will look when you first put in new plants, as well as how the plants will grow into their new space over the course of the summer. Remember, plants are meant to accent the house, not compete for attention. Shade on the yard and house is great for hot days, but can obstruct views from indoors and out if overgrown. Trim back plants that block too much sunlight. Too many overhanging branches and creeping vines make the home appear dark and small and scream “upkeep” to buyers. Large trees also affect the health of plants and lawn around them. Brown shrubs or dying plants may be competing with your trees for nutrients. Even one brown splotch will diminish the look of the most vibrant yard. Every plant requires different amounts of sunshine. Learning about the plants you buy will help you plant strategically. 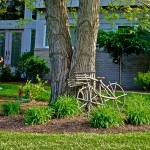 Trees and shrubs are an easy and inexpensive way to add value and curb appeal to your home. But as we discussed above, it’s a fine balance. Before you go crazy and order a slew of saplings, there are a couple of things to keep in mind. First, plant the right species for your climate zone and your needs. Do you want flowers in the spring? Shade all summer long? Second, keep in mind that as trees grow, their root systems expand out. Trees planted too close to the house can crack the foundation, causing big problems down the line. If planted too close to city sidewalks, the homeowner could foot the bill for damages caused by growing roots. Use the Arbor Day Foundation’s tree wizard to get a clearer picture of what trees would work best for you. The hellstrip is the spot of grass between the sidewalk and the curb. It’s probably fair game as additional gardening space, but check with your local municipality and HOA first. Giving the hellstrip a little a attention can go a long way toward making your home stand out. Get ideas from the neighborhood, so yours complements the rest of the block. Then, make it pop with some helpful hellstrip ideas from the always-inspiring internet. How’s your house’s curb appeal this spring? Find us on Twitter and Facebook! We’d love to hear your best tips on attracting buyers with a beautiful front yard. If you’re looking to buy this year, get in touch with one of our First Option Mortgage branches.